How much fruit and veg should we eat? The government says yes - but people should eat at least five portions of fruit and vegetables a day. The advice is based on World Health Organization guidelines, which are 25 years old. Dietitians say eating five a day is enough to get the protective benefits of fruit and veg - although eating more may be additionally beneficial. For an adult, a minimum of 400g of fruit and veg should be eaten every day, or five portions of 80g. The amount varies for children, based on activity levels and age, but a rough guide is that one portion should fit in the palm of their hand. Fruit and vegetables do not have to be eaten on their own and can be cooked in dishes such as soups, stews or pasta meals. Can't I just munch on five carrots and be done? No. Although carrots count towards your five-a-day, to get the most benefit your five portions should include a variety of fruit and vegetables. This is because different fruits and vegetables contain different combinations of nutrients and vitamins. What's best to eat then? Almost all fruit and vegetables will count. Generally, raw vegetables and fruit will contain the most nutrients because cooking can remove some nutrients. Likewise, fresh fruit and vegetables are thought to be more nutrient dense than preserved ones. But frozen fruit and vegetables are still good, and dried fruit, such as currants, dates, sultanas and figs. Those in ready-meals and shop-bought pasta sauces, soups and puddings are also included, but advice urges "only to have them occasionally" or in small amounts as they are often high in salt, sugar and fat. Do tinned fruit and fruit juice count? Yes, says the government (although the latest study did not find this). Juice should be unsweetened, and only counts as one portion a day, as it contains less fibre than whole fruits and vegetables. Fruit must be tinned in natural juice, or water, with no added sugar or salt, and not in syrup, otherwise it will not be as healthy. Beans and pulses also count, but again only as one portion as they contain fewer nutrients than other fruits and vegetables. Smoothies may count towards more than one portion if they contain all the edible pulped fruit or veg, and depending on their ingredients. Potatoes are not one of the five-a-day items. This is because they mainly contribute starch to a healthy diet, which is a good source of energy and helps digestion. They are classified in the same group as bread or pasta by the government. Skins should be left on when cooking as they are a good source of fibre. But sweet potatoes, parsnips, swedes and turnips do count as five-a-day foods, as they are usually eaten as well as the starchy bit of the meal. While its tempting to believe that eating a single fruit or vegetable containing a certain nutrient, vitamin or antioxidant will be the answer to our health needs, this is not borne out by science. It's best not to concentrate on any one food in the hope that it will work miracles. 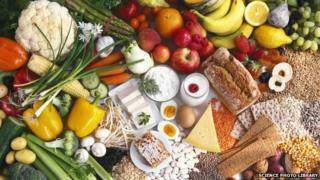 Instead, dietitians say we should aim for a well-balanced and varied diet that includes plenty of fruit and vegetables. Many countries - including Germany, the Netherlands and New Zealand - recommend five portions a day. Some others - including Canada and Japan - recommend seven or more. France goes as far as recommending 10 portions of fruit and vegetables a day. In Australia, they say the emphasis should be on eating more vegetables than fruit and recommend five portions of vegetables and two of fruit per day.